Designed for autistic/dyslexic children, but suitable for all children too. Six games to help children learn to blend cvc words (three letter words with a short vowel sound). All in one convenient book. Supplied in pdf format, with full instructions for how to make and play and helpful hints as to how to help your child. Ready to print and play. Printer required. 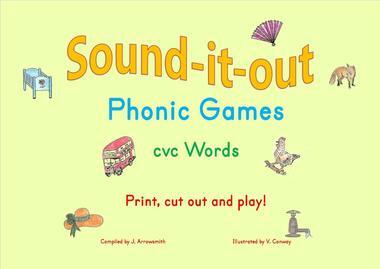 Three books of phonic worksheets (twenty pages each) to help children learn the initial sounds through to blending four letter words with a short vowel sound. These complement the games, but stand alone too. Three early maths books, with twenty-five pages each. They take the child from the early stages of learning to count, to simple adding and subtraction. Plenty of repetition helps to build confidence.